As with every new "technology" that has entered society since the advent of the quill and the printing press, there are immediate interests and innovations pursued by early adopters, innovators, scientists and end users. In most cases, the technology is used for a while and then educators begin to look at the potential benefits for learning and instruction. Usually that happens when we realize the technology is popular and the younger generations are enthralled with using it — and therefore it is "here to stay." As educators, we then begin to look at how the technology is impacting the way students think and process information — and how we can integrate the technology in the teaching and learning process. That model is an apt description of the state of virtual reality (VR) technology in education. As VR increasingly goes mainstream, there are various points of view on its current effectiveness in teaching and learning — and its potential use moving forward. "Authors disagree in their opinions about the real value of VR interfaces. VR has rapidly emerged as a very promising technology that will probably match the innovation of technologies such as multimedia/hypermedia." "Just within the last two years, there has been a great leap forward in immersion techniques. Along the way, we've discovered that VR is not just for entertainment — gaming and movies, for example — but that it also has broad commercial applications for the likes of virtual travel, real estate evaluation, and remote training." "It's been a decades-long journey for virtual reality, and 2016 will likely be its biggest step forward. This won't be the year that virtual reality goes mainstream, but you're sure to hear more about the technology than ever before with big product launches from Oculus/Facebook, HTC/Valve, Sony, and Microsoft (although its HoloLens is technically augmented reality)." Carson points to mobile VR as having the potential to move the technology into the mainstream, but perceives it as an entertainment technology rather than an instructional technology, with its uses remaining mostly outside of education. Increasingly, however, more educators are looking at how VR can actually impact learning. Over the years, social scientists have dialogued about the benefits of virtual environments (VEs) in social research and their potential for training and education (Fox, Arena, Bailenson, 2009). In an Educause Review article, Georgia State University's Bryan Sinclair points out that VR could become a mainstream instructional technology quite quickly if and when the technology becomes more accessible to users (Sinclair, 2016). The article continues with a conversation with a university faculty member who describes the benefits of the technology in "bringing to life" for students what otherwise would be impossible for them to experience. As educational theorist John Dewey established long ago, effective learning is experiential (Dewey, 1938) — and VR provides a direct method by which that can be realized. VR technology is still evolving and moving more into mainstream, particularly with mobile technology, buts its effectiveness in regular classrooms and with online students is still being realized. As with simulation technology, many difficult and "risky" training experiences (such as those in medical and military practice) can be learned virtually through VR. That means that the cost of the training can be lessened, along with the potential risk of actual situations. Additionally, students can experience places and situations in the world they could not otherwise experience, and enrich their learning experience as a result. In regular classrooms, however, which are bound to text-driven curricula and test-driven outcomes, it will take longer to integrate VR and, ultimately, it will take longer for us to become more aware of the technology's effectiveness in the learning process overall. At any learning level, there are always challenges for teachers to find ways to provide "real-life" contexts for learning and opportunities to experience something "first-hand." Beyond specific uses of VR in military or medical training, what benefit could VR have for more text-based study programs? One obvious possibility would be providing first-hand virtual experiences for students; for example, allowing teachers in training to observe classrooms virtually, giving environmentalists a virtual view of the devastation of forested regions, or letting sociology students experience human and social poverty around the world. My sense is that VR experiences could help students develop strategic problem-solving skills. Critical thinking and relevant problem-solving are still front-and-center of learning and should remain so. Without critical thinking and problem-solving, new knowledge cannot be developed or applied, and learning remains static and prescribed. In today's world, socio-political systems, cyber systems and environmental systems are changing so quickly, students must become knowledge builders and the constructors of real and relevant solutions at a rapid pace. Current text-driven courses that are fully prescribed and standardized will never be adequate in the changing face of global realities. There have been various attempts at using global gaming to involve participants who would never otherwise be working together, coming from different countries and languages, to collaborate on global challenges. Participants from countries where poverty and famine are a daily reality, for example, have able to contribute effective ideas and solutions, while participants who have never really experienced either first-hand were able to learn from their peers in other parts of the world. This kind of global collaboration must continue and become more mainstream in the near future. Similarly, if students have an opportunity to "experience" a virtually real context they otherwise would not, much could be learned. While we train and educate current students on specifics around their subject area and professional future, VR could provide ways in which collaboration and problem-solving could become a global norm — and new solutions could result more quickly. The potential for immediacy in learning, as well as relevancy and innovation, would be maximized. Additionally, VR could allow design and creative art students to develop portfolios like never before. There are many new and innovative architects and designers who would be able to virtually "build" a design – use the same parameters and criteria, the same material and see the end result without spending vast amounts of money on a physical build. Having a VR "portfolio" would be of huge benefit for new and emerging designers to be able to virtually present the experience of the end product and, therefore, access funding and opportunities much faster. It is important to realize that VR technology is not only an individual experience, but groups can experience the same reality — virtually and simultaneously. For example, I could be in a different physical location but access the same VR experience as others in my class or study group. This allows for group interaction and collaboration on projects and responses. 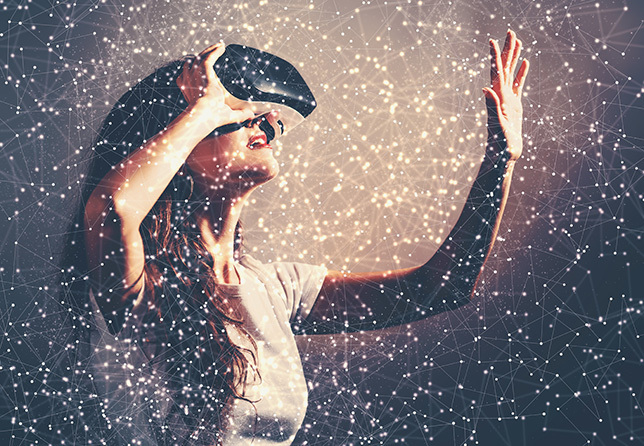 Therefore, as mediated learning environments have used internet and multi- and shared-media technology to mediate group learning, VR can also provide enriched shared learning through shared virtual reality experiences. The challenge with using VR in group educational environments such as school or college classrooms is the expense of the equipment (hardware and software) – which, although it could be a one-time purchase, still requires schools to provide budget dollars to set up the technology. As always, the more we can evaluate the benefits to learning, the more we can expect money to be made available. Also, instructional designs would need to integrate the use of the technology and adjust skill development value and response opportunities, so that students can be awarded for advanced skill development as well as content knowledge. Students should also be provided with relevant response opportunities beyond text-driven tests and exams. Student must be given an opportunity to provide VR-based responses through creative and applied ways, such as their own VR environment productions. According to Brennan Wade, a VR curriculum designer for college-level academic programs, while current VR technology may be cost-prohibitive for school and college classrooms for the most part, the future wave of increased augmented reality (AR) technology is evolving. Wade claims that AR provides customization to the VR experience that will increase in relevance to student learning. So, while VR allows the user to be "immersed in a totally different environment" or reality, Wade explains, "AR takes the user's immediate environment and 'adds' to it." For instance, if I have on my augmented reality spectacles and look up to the sky, a weather report will appear that tells me exactly what weather changes will occur and when. Or, if I have a favorite fictional character, that character can appear within a VR environment to augment it. Wade is convinced that while we are years away from VR replacing or even corresponding to the widespread use of iPads in classrooms, the advent and growing use of AR will overtake VR and be more cost-effective and user-focused for classroom use. "Therefore, in thinking through the importance of individual student voice and publication (authorship) and collaborative knowledge building, educators can then realize the potential of newer technologies in accomplishing those goals." In evaluating the instructional benefits of VR and AR, the challenges are similar as is the need for attention to be paid to student "voice" and authenticity. While most educational theorists and researchers will agree to this assertion, newer technologies are increasingly providing ways in which students can become owners of their individual learning processes like never before. The bigger challenge is to encourage more instructors and teachers to innovate with and learn these technologies so that they can integrate their use into instructional designs. Eventually, academic administrators and accreditors will "catch up" as we continue to demonstrate the benefits to learning. In order to do that, however, we must continue to "push ahead" with technology and practice its use in the courses we teach. Sanchez, J., Lumbreras, M., Silva, J.P. (2001). Virtual Reality and Learning: Trends and Issues. Marlett, D. (2015). The Virtual Reality of John Carmack. D CEO, September 2015. Carson, E. (2015). Virtual Reality in 2016: The 10 Biggest Trends to Watch. TechRepublic, December 2015. Fox, J., Arena, D., Bailenson, J.N. (2009). Virtual Reality: A Survival for the Social Scientist. Stanford University, Stanford, CA. © 2009 Hogrefe Publishing Journal of Media Psychology 2009; Vol. 21(3):95–113. Sinclair, B. (2016). The Promise of Virtual Reality in Higher Education. Educause Review, March 2016. Dewey, J. 1938. Experience and Education, New York: MacMillan. Reynard, R. (2008). Podcasting in Instruction: Moving Beyond the Obvious. THE Journal, June 2008.